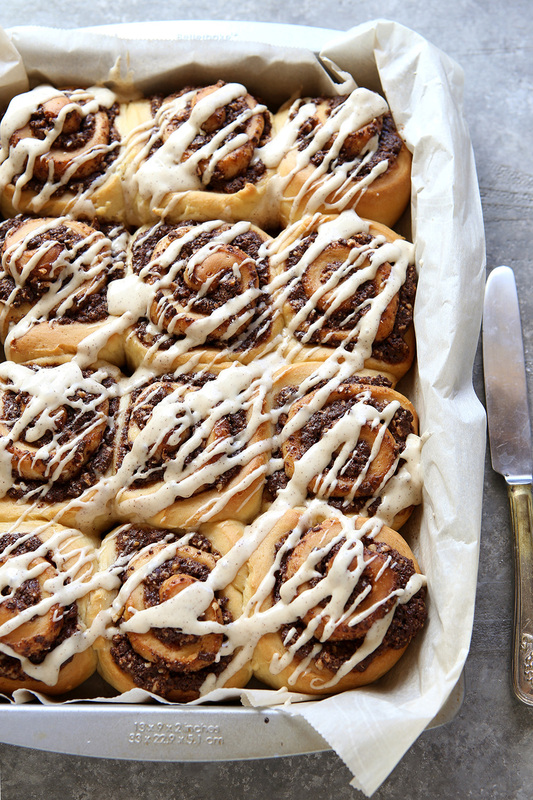 These chocolate hazelnut sweet rolls have a homemade filling and an easy espresso glaze, making them a wonderful indulgence for breakfast or brunch. In the bowl of a stand mixer fitted with a dough hook, combine 1½ cups of the flour with the yeast and salt. Add the milk mixture and mix until combined. Add the eggs one at a time, mixing after each. With the mixer on low, add the remaining flour ¼ cup at a time until dough clears the side of the bowl but is still slightly sticky to the touch. You may not need all 3½ cups of flour. In a food processor, pulse the chocolate chunks, hazelnuts, sugar and salt until the nuts and chocolate are in very small pieces but a few large chunks remain. (If you do not have a food processor, you can use a sharp knife.) Add the butter and pulse a few times just until the mixture comes together. It should be slightly sticky and still crumbly, do not process it so much that it forms a paste. On a lightly floured surface, roll the dough into a long rectangle approximately 10x15 inches. Spread the chocolate hazelnut mixture evenly on top. Starting with a long end, tightly roll up the dough into a long log. Use a sharp knife or unflavored dental floss or thread to cut dough into 12 rolls. Place rolls in a greased 9x13-inch pan. Cover with plastic wrap and let rise until doubled, about 30-45 minutes. Meanwhile, preheat oven to 350°F. Bake rolls until golden, about 30 minutes. Let cool slightly. Whisk together the powdered sugar, espresso powder, vanilla extract and enough milk or heavy cream to make a thick but pourable glaze. Drizzle over warm rolls. Rolls are best the day they are baked, but will keep in an airtight container at room temperature for up to 3 days.